PanARMENIAN.Net - The Collective Security Treaty Organization (CSTO) discussed the possibility of inviting Azerbaijani President Ilham Aliyev to a summit in Astana as a guest, Kommersant reported citing two sources who participated in the preparation of the CSTO meeting. According to the sources, the idea was expressed by the President of Kazakhstan, Nursultan Nazarbayev, and was supported by some other leaders, including Belarusian President Alexander Lukashenko. 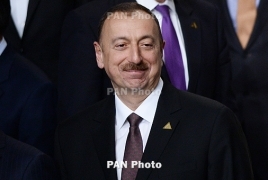 Aliyev, sources said, was ready to visit Astana, but the Armenian side opposed the idea. “Heads of countries that are not members of the alliance can take part in CSTO events, if all members of the organization agree,” a senior official explained. In this case, he said, there was no consensus. Armenian Prime Minister Nikol Pashinyan is visiting Kazakhstan to take part in the Council meeting of CSTO member countries on Thursday, Hovember 8.